The Navy’s newest Zumwalt-class destroyer, USS Michael Monsoor (DDG 1001), was commissioned Jan. 26 at Naval Air Station North Island. Twenty gold star families and four Medal of Honor recipients witnessed the Navy’s second Zumwalt-class destroyer enter the fleet. 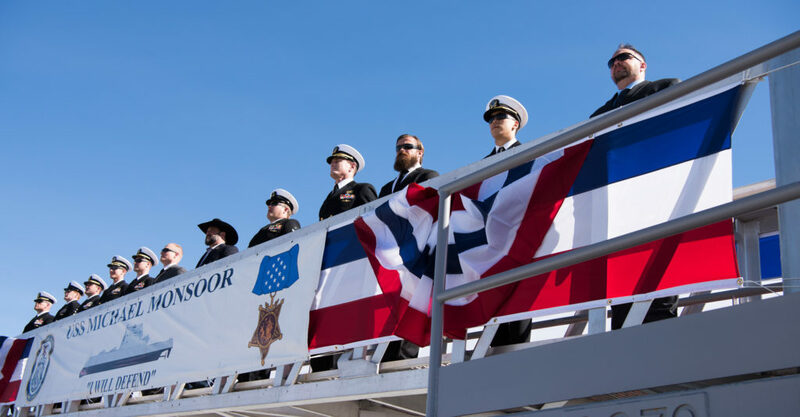 California Congressman Scott Peters delivered the commissioning ceremony’s principal address for the ship named for the southern California native. “’You never quit.’ Those are the words Michael Monsoor wrote with permanent marker inside the camouflage hat he wore throughout his [Basic Undersea Demolition School] training at the Naval Special Warfare Training Center here at Coronado,” said Peters. “If you visit the quarterdeck of the magnificent new ship we commission this morning, you will see his hat there with those words inscribed within it. It is encased in glass where and it will remain on display permanently for the life of the ship. The letters are faded from time and wear but their significance and how Michael applied them to his life are as vivid and meaningful today as they were that day when he wrote them many years ago as his reminder to persevere. The words ‘you never quit’ are also brandished prominently throughout the ship as if Michael himself is offering encouragement to every man and woman who sets sail upon her. Sally Monsoor, Michael Monsoor’s mother, served as the ship’s sponsor and delivered the time-honored first order to “man our ship and bring her to life!” The crew of 148 officers and enlisted personnel were joined by servicemembers who served with Monsoor in Ramadi as they raced aboard to man the rails and watch stations. Capt. Scott Smith noted the crew’s dedication to the ship and one another as well as the community in Maine. He credited then with carrying forward the character of the ship’s namesake. “They not only learned new technologies, they advanced them, and stand today at the leading edge of the Navy our nation needs,” said Smith. “This is the crew that mans Michael Monsoor: One-hundred-and-forty-three Sailors performing acts they believe are ordinary. The soldiers and SEALs that stand alongside them, they too perform their seemingly anonymous, ordinary acts which are anything but, and ladies and gentlemen that’s why this ship is so important. Because it is the recognition that the true source of American power lies in its people. The nearly 16,000-ton Michael Monsoor was built by General Dynamics Bath Iron Works in Bath, Maine. The ship is 610 feet in length, has a beam of 87 feet, and a navigational draft of 27 feet. The ship is powered by two Rolls-Royce main turbine generators, two Rolls-Royce auxiliary turbine generators, two 34.6 MW advanced induction motors to speeds up to 30-plus knots. USS Michael Monsoor will be homeported at Naval Base San Diego. This entry was posted in Commissionings and tagged commissioning, commissionings, michael monsoor. Bookmark the permalink.